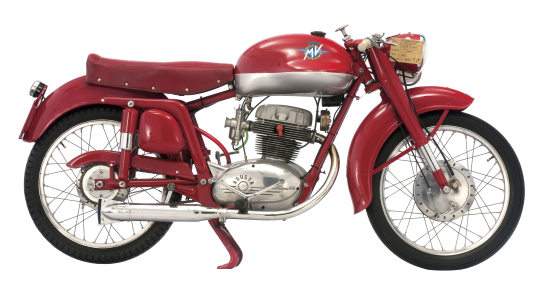 The single-cam 175, introduced in November 1952 and put into production in 1954, was a fundamental importance to the technical, commercial, and sporting evolution of MV Agusta. From an engineering point of view, the 175 CS was important because it was the first 4-stroke MV to go into volume production. It was particularly well accepted thanks to its sporty riding position, lowered handlebar, and long seat. With its affordable pricing ranging from 235,000 to 300,000 Lira ( $376-$480), this model was a good basis for competition use. The bike weighed 1100Kg, and had a top speed of 115 Km/h, thanks to the engine’s massive 11 HP. Its 4-speed transmission useed a wet multiple plate clutch to feed the power to the rear tire. During the 3-year production run, approximately 4,500 were built.